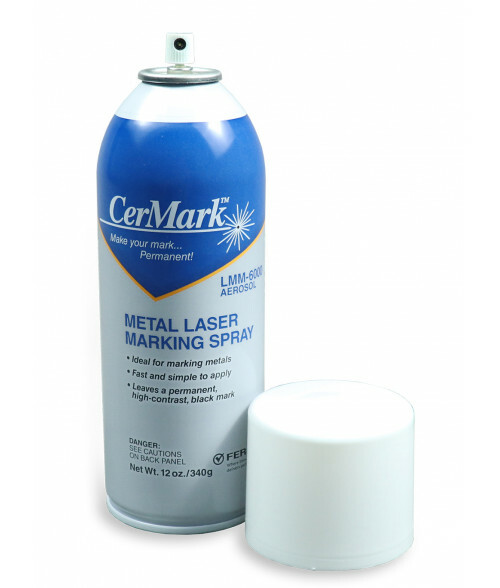 CerMark Metal Marking Spray Can creates solid black engraving on uncoated metals. It is premixed at the right consistency, so no diluting is necessary. Applied like a regular can of spray paint, one can will cover approximately 1100+ square inches. Works great until you've reached 1/4-3/8 on some cans (every 3/10 we've seen issues). After that it bubbles and sprays clumps everywhere. I've also had a can (that was properly stored & handled) blow up in my face. In my eyes, nose, etc... Believe the plastic inject insert is what failed. After being seen, I checked out ok. This stuff is very expensive and at a loss. Luckily, JP took care of the one can that blew up. This is why we continue to shop with them. We stand behind our products and support other companies that follow the same code. Thank you again guys! We had some success cutting the cans open and painting the rest on each part. Besides that hands down this is the best stuff on the market! Cermark needs to work on their product defective rate in my opinion. Works on stainless steel. DOES NOT WORK ON ALUMINUM even though it is advertised that it does. Soak your aluminum in water overnight after you laser it. The Cermark will wipe right off, even using the slowest speed and highest power settings.